The Mountain Grill is open for lunch Thursday through Sunday, and on evenings when we have special events, including our Thursday Evening Sunset Series. In the summers, we’re open daily except Monday, and in the fall, seven days a week! During September and October, we serve a limited, more concession-type menu in order to quickly serve our larger crowds. When you visit the mountain, you can count on our Mountain Grill to serve up a delicious lunch, dinner, or snack! We’ve created a farm-to-table menu that makes you feel right at home. 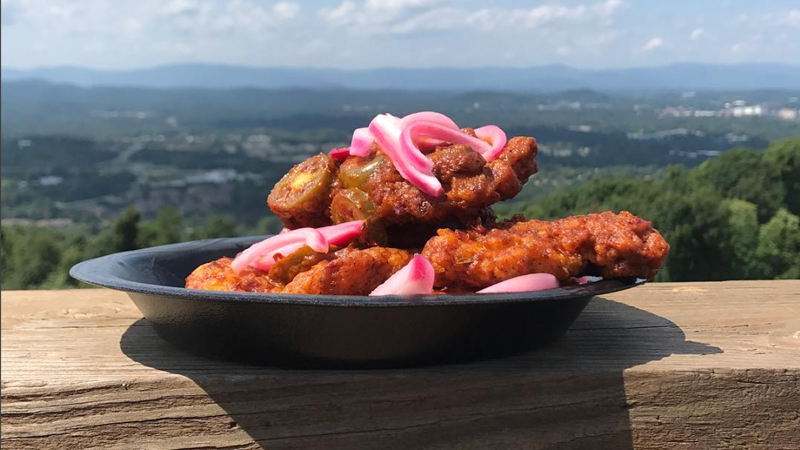 Locals, head up the mountain on your lunch break—we can provide a little solitude (if you want it), a great view (most days), and a delicious lunch (always!). The service is quick, the food unique and tasty, and the atmosphere can’t be beat! All our entrees are specially prepared to pair wonderfully with Prince Michel wines and Bold Rock hard ciders, available on site. Our fresh sweet ciders taste pretty good, too. Farm-to-table-to-glass! There’s always a special or two going, and you won’t want to miss our house-smoked Apple Wood Pulled Pork BBQ Sandwiches, which are always on the menu! 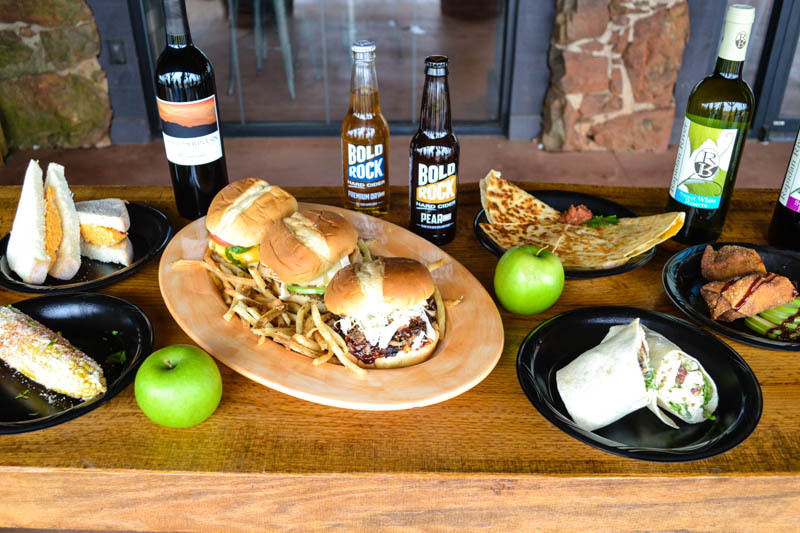 Depending on the event and the time of year, you can find anything from burgers (local beef) and fried chicken sandwiches, to house-made chicken salad, and vegetarian options as well! Our fresh fruits and vegetables are featured, in season. You can even get it to-go and take it home! Bringing a group and need a box lunch or group meal for your visit with us? We can take care of it. Planning a private event (wedding, reception, corporate retreat) and need a special menu? We’ve got it. Let our staff help you customize a menu to suit your needs! Email our event manager to start planning!